Ego is responsible for protecting your self-image; it creates the compartments where everything undesirable about you has been hidden. What blocks love is not the presence of these shadow energies but the division of the psyche that came about when your ego started building inner walls. Love is a flow, and walls keep the flow out (24). If Chopra’s premise is true (that the ego battles with the Self), then my inability to experience love in its truest, most pure form, has been the result of my fated attempts at preserving my “fragile” ego—which in turn is the cause of my “emotional constipation”. That being said, it’s now time to “le’go my ego”! As a self-proclaimed bibliophile, I started reading The Path To Love: Spiritual Strategies for Healing by best-selling author Deepak Chopra when a dear friend (Sunila) suggested I look into some of his videos on meditation. While in search of Chopra’s videos, I came across the before-mentioned book title and was immediately in awe of his prolific and profound words. Recently, while reading the chapter titled “The Spirit of Romance: Tender Courtship”, the following words from Chopra leveled me. The exhilaration of falling in love is an escape from ego, its sense of threat, and its selfishness…the ego cannot do two things: it cannot abolish fear, since ego is founded on fear; and it cannot create love, since ego by definition shuts out love. The reason the ego and love are not compatible comes down to this: you cannot take your ego into the unknown, where love wants to lead. If you follow love, your life will become uncertain, and the ego craves certainty. You will have to surrender to another person, and the ego prizes its own will above anyone else’s. Love will make your feelings ambiguous, and the ego wants to feel the certainty of right and wrong. Many other experiences that cannot be comprehended by ego apply to love—a lover is confused, spontaneous, vulnerable, exposed, detached, carefree, wondrous, and ever new. Love’s journey would be terrifying if we didn’t have passion to give us courage—the blind courage of lovers, it is often called. It would be truer to call it the blind wisdom of lovers, because the ego’s certainty is an illusion. Uncertainty is the basis of life (115-116). The ego is at war with the Self (spirit). Fascinated by human behavior, I took my first psychology class as a sophomore at Denison University. I continued to take psychology classes and even considered a dual major in English and Psychology, but my love of literature and writing won out. A couple years after I had graduated with my B.A. the yearning for the field of psychology haunted me and I found myself in another institution of higher learning, Marshall University, simply taking psychology classes because of my curiosity with the subject matter. But let’s get back to this business of consciousness and the battle of the Self and ego. In an effort to fully understand Chopra’s words, we must return to our notes from “Psychology 101” where many of us learned about the three parts of the human psyche, as defined by noted psychoanalyst Sigmund Freud. Yes, that is certainly a lot to ingest, but I am certain that Freud’s insights about human behavior, coupled with Chopra’s insights about love, will lead us to a better understanding of how many of us have blocked the flow of love in our lives. Okay, now that we’ve taken our notes and have a more insightful understanding of Freud’s assessment of human behavior, here is one last piece of information—an illustration of these systems. That being the premise we are working from, we have to understand what this ego is all about. According to Chopra, falling in love is about journeying into the unknown and that is a “scary” place for our rational mind (ego) to go. The unpredictable nature of love stands in contrast to the ego’s desire to reason and rationalize. 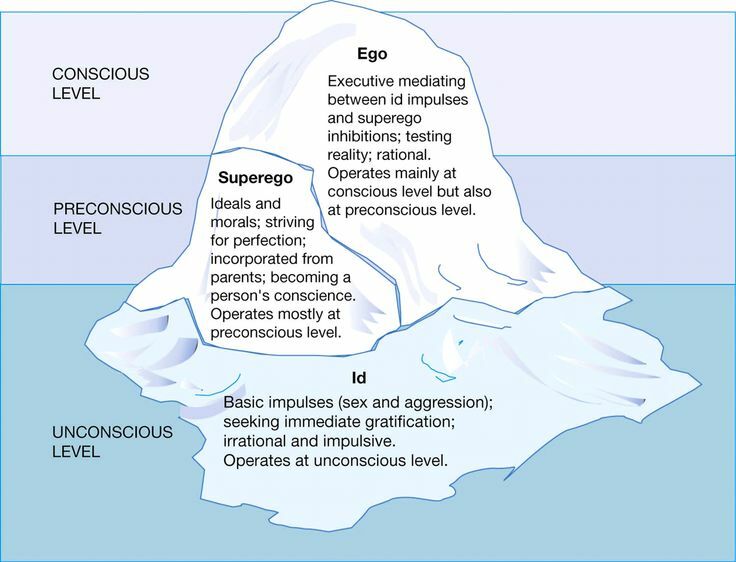 The ego seeks to avoid pain and does so by weighing the id impulses against the superego’s understanding of societal values and morals. Love desires for us to surrender, but the ego cannot conceptualize surrender because it does not come across as “rational”. However, “Surrender is the door one must pass through to find passion” (Chopra, 1997). As I reflect over my most recent experience with “love”, I have drawn the conclusion that it was neither pure nor true because it was tainted with an intrinsic need to protect my heart from the “unknown” variables associated with love. If I am to truly love, myself, and another spiritual being, I must relinquish my ego. While it supposedly serves to assist me in rationalizing the world around me, there are just some things that need not be rationalized—love for instance. Chopra notes that, “Getting to true love is a growth process, and the first requirement is to become aware of when you are not being true”. We are not being true to the Self (spirit) when we allow our ego to dominate our actions in the face of love. In an effort to maneuver through Chopra’s four phases of romance (featured below), I have decided to Le’Go My Ego! The patterns in my “love life” have shown that I tend to get so far as the Courtship phase and then the relationship begins to crumble. I am going to venture to say that the crumbling is a result of not being true/honest about my feelings and perceptions. When true Intimacy began to surface, my ego pumped the brakes and I became fearful of sharing my Self. My vice is my inability to communicate from the deep recesses of my heart, and this has led to many an unsuccessful attempt at love. Knowing and acknowledging this now is freeing me to experience the love that I have longed for. It is clear to me that, “The courtship phase succeeds to the extent that a man and woman can dismantle their defenses; it fails to the extent that they build new defenses together” and “Even the most intoxicating romance will not be able to overcome a history that places ego needs much higher than those of relationship” (Chopra, 1997). I know in my heart of hearts that I want a man in my life who will stand with me through the good and the bad. I cannot love and respect a man who flees at the slightest sight of danger and/or discomfort. By nature, I am a fighter and the next man I allow myself to fall in love with must too be a fighter. After all, “If survival is paramount in a dangerous world, two are better at it than one” (Chopra, 1997). No truer words have been sung; I am assuredly having a private party. In this very moment in time I am learning how to love me and I’m celebrating the woman I’ve become. Despite the pangs of life, I am moving into my future with optimism and love for self! That being said, it was a most ironic morning when a dear friend of mine posted the following on Facebook regarding Love Languages earlier today. 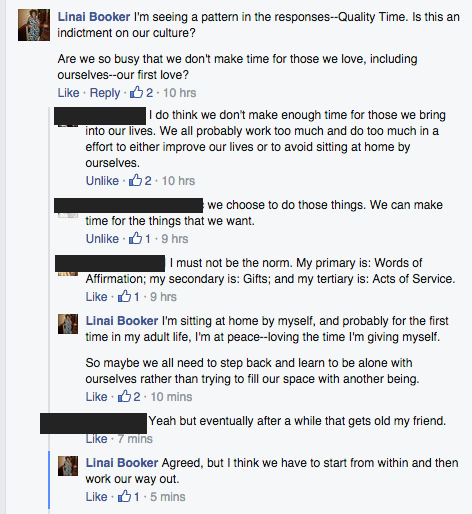 Within minutes people were chiming in about their specific Love Language and personal experiences related to them. Still pained over this issue of Quality Time, the following words from Deepak Chopra brought an overwhelming sense of revelation and release to me. People who find themselves alone rarely feel any incentive to explore love. They await contact with another person or run out to seek it. Thus we become dependent on other people to make us feel totally and permanently loved. This expectation will, however, always be defeated, and although we blame those who failed to respond to us, who responded but then left, who stayed but then changed their minds, none of them is finally the cause of our problem. The cause is our inability to develop an unshakable relationship with ourselves. The Self is the source of love. People who live their own love stories have learned this lesson above all. Please don’t get me wrong. I am not proposing that we shut ourselves up in our domiciles, become reclusive, and forget about relating to others. What I am proposing is that we first get a handle on loving ourselves—fully and completely, before we open ourselves up to another being. What was even more ironic was that earlier this evening I had been texting back and forth with a college friend, and this same issue surfaced. Here’s how the “textversation” went. Me: And how are you today? K: I’m good—I had class so it got my mind off things. K: Yeah he texted me last night and today. Just going to remove myself emotionally from him. It’s crazy that all these years later I still love that man. and if he’s dishonest then I don’t need to be bothered. from him like he’s done me. Me: I think that is very practical. K: What did he say? K: What did you say? “Thanks”. K: Games ****** play—I tell ya. Me: Exactly. Be all in or be out. because I refuse to be sucked back into his vortex. Me: I’ve taken back control and it feels good. Embedded in our words is disappointment based on the actions and/or inactions of men that we love(d). But it isn’t fair to hold them accountable without taking responsibility for expecting another human being to make us feel loved. We must be our own source of love. To hold these men accountable is being judgmental because “Judgment is whatever tells you that there is something wrong with yourself or someone else” (Chopra, 1997). Furthermore, Chopra cautions that, “There can be no sense of security in your existence when it depends upon outside factors [another being], for the unpredictable changes of reality can never be controlled…As long as love is [external] pleasure, its end—a sad tapering off into indifference and inertia—is predictable.” All that being said, the TRUTH that each of us must embrace is that, “There is no one out there waiting for you. There is only you and the love you bring to yourself” (Chopra, 1997).